There are all different types of herbal supplements and diet pills available for weight loss. One herb that you may find in certain formulas marketed for weight management is Dandelion. Also known by its botanical name, Taraxacum officinale, Dandelion is a flowering weed that you’ve probably seen growing in fields, in your own lawn, or in the yards of others. Believe it or not, these pesky weeds actually have medicinal properties and are well known for their health benefits. Dandelion contains a number of powerful antioxidants in the form of vitamin B complex, as well as vitamins A, C and D. These vitamins help to eliminate free radicals in the body and can also provide cardiovascular support. In addition, this root is often used as a liver tonic as it is high in potassium, zinc and iron. What’s more, this common weed has shown to be a natural diuretic. The diuretic effects of Dandelion have been studied* and researchers have discovered that when human subjects ingested dandelion, the volume and occurrence of urination increased in these individuals. Although more research needs to be conducted on the herb to determine the full potential of its effects, many believe that it could be quite the beneficial natural diuretic. That said, in terms of weight loss benefits, there is no evidence that Dandelion used as diuretic provides any benefit at all to dieters. A common misconception among dieters is that diuretics used in weight loss products can result in fat loss. However, this is far from the truth. What they actually cause is water loss. They work by flushing out fluids from the tissues in your body and expel it through urine. This provides the body with more definition and eliminates puffiness, providing the illusion that you’ve lost fat when all you have lost is water. Not only is the “slimming” effect of diuretics temporary, but they don’t actually help you lose weight. The water that is eliminated from your tissues, will rebuild again. Moreover, diuretics can be dangerous, because if the users of these pills do not drink enough water while taking them, they can cause dehydration and other health problems that can be quite serious. Another important fact about diuretics is that they are commonly used in formulas designed for bodybuilders. Bodybuilders use diuretics to rapidly deplete the fluids from their tissues before a competition or performance. The reason is it helps to minimize the layer of tissue over the muscles, which enhances muscle definition. 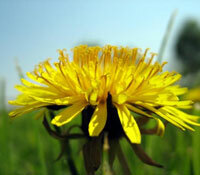 Since this is the case, you should be very wary of weight loss products that contain dandelion among its ingredients.